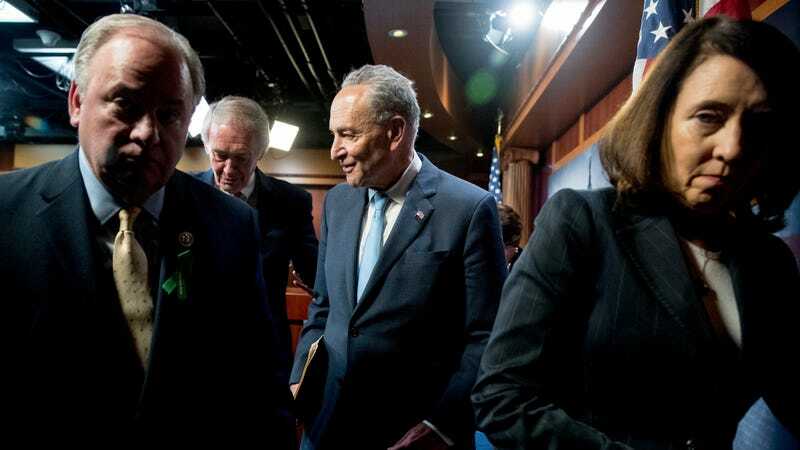 Rep. Mike Doyle, Sen. Ed Markey, Sen. Chuck Schumer, and Sen. Maria Cantwell, leave a news conference on Capitol Hill after the Senate passed a resolution to reverse the FCC decision to end net neutrality. The United States Senate on Wednesday passed a resolution to nullify the Federal Communication Commission’s rollback of net neutrality, which is slated to go into effect less than four weeks from now. The vote was both a significant victory for net neutrality supporters and a stinging rebuke of Ajit Pai, who’s time as FCC chair has been mostly consumed by efforts to unravel the Obama administration’s pro-internet legacy on President Donald Trump’s behalf. The Senate voted 52-47 to rescind the FCC’s incongruously titled “Restoring Internet Freedom Order,” which seeks to abolish rules passed in 2015 that prohibit internet service providers from throttling or censoring online content. The new FCC rules would also enable broadband providers to charge major internet companies fees to have content and services delivered at higher speeds, a move that many small businesses argue would grant larger competitors an unfair advantage. The Senate’s “resolution of disapproval,” as it’s called, was put forth by Sen. Ed Markey under the Congressional Review Act, a law that allows Congress to review and reject federal agency rules and decisions under certain time constraints. To overturn an agency decision, the CRA requires only a simple majority in both the House and Senate. But as with any normal piece of legislation, the president’s signature is also required. Now that the resolution has passed the Senate, it will go to the House of Representatives, where it overrides a similar resolution introduced in the lower chamber last month. There, it will face a new and more strenuous challenge. In other words, assuming every Democrat is on board, they will still need 25 Republicans before a vote can even be called. One benefit to the CRA is that it forced 99 US senators (Sen. John McCain was absent due to health reasons) to openly declare their stance on net neutrality. Assuming the issue remains alive, the vote may prove useful ammunition to primary and general election challengers down the road. (Only 33 Senate seats are up for grabs in November, while all 435 House seats are on the line.) This means there will be significant pressure on House Republicans to resist the CRA effort—in addition to pressure from telecom industry lobbyists—particularly among those who may secretly support net neutrality or at least respect the overwhelming majority of their constituents who do. “This isn’t a partisan issue,” Rep. Mike Doyle, the Democrat leading the House effort to pass the CRA, told reporters on Capitol Hill after the Senate vote. Tomorrow, a discharge petition will be made available, Doyle said, so that members can advance the CRA bill. “I urge every member who supports a free and open internet to join me and sign this petition so we can bring this legislation to the floor,” he said. “As [Sen. Markey] has said, it’s time for the American people to know where their members of Congress stands on net neutrality,” Doyle added, saying that lawmakers would be “held accountable” on Election Day. While the Senate had only 60 legislative days to discharge the resolution from committee and force a vote, the House will have until the end of the 115th Congress, on January 3, 2019, to pass it. It’s entirely possible, ergo, that we won’t see any movement on the CRA front for months. Whether President Trump would veto a joint-resolution is difficult to predict. If anything, his policy positions are unpredictable day to day. He’s also prone to making decisions based on whether they’re popular with his base; that doesn’t align with the wishes of Republican party leaders. Given this baffling dynamic, net neutrality advocates point to a recent poll that shows 82 percent of Republicans oppose the FCC’s new direction. That’s up from 75 percent in December. Despite efforts by conservative groups to bring Republicans voter around to the idea that the 2015 rules are “bad” because it was the Obama administration that ushered them and government regulation is bad by definition, the loathing Trump’s base holds for companies like Comcast and AT&T appears, at least so far, to outweigh their contempt for the Democrats.